About : B & L Construction, Inc. The Connecticut River and Long Island Sound converge near the quintessential New England town of 0ld Saybrook, CT, home to B&L Construction. With one of the region’s largest concentrations of 18th century colonial and 19th century federal buildings, 0ld Saybrook is a fitting headquarters for a construction company devoted to lasting quality. Allen Hull made quality the B&L hallmark from its beginning in 1993. 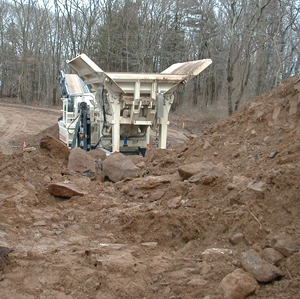 Prior to that time, Hull developed a sand and gravel business, and also worked in landscape construction. 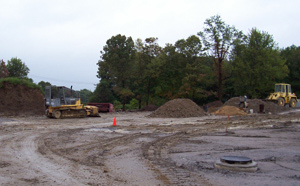 “We are a small company that does projects ranging from paving a driveway all the way up through a large commercial complex,” Hull said of B&L, which handles all aspects of site work from clearing the land and grubbing to site utilities, paving and some landscaping. B&L is also bondable. “We provide our customers with a quality job, completed on time at a fair price.” B&L started with seven employees and now serves clients throughout southeastern Connecticut with a team of 35. Hull eliminates the superfluous layers of management by dealing directly with clients and then coordinating job requirements with seasoned foremen and superintendents. The good folks in the field include Frank Soares, Pete Taylor, Bob Moon, Scott Hoyt, John Serbaschewicz, Rod Brown, Jim Mack, Peter Rodgers and Bruce Sypher. At the helm in the office for B&L is manager Denise Sypher. “The reason this company is successful is because we have great people and great resources,” added Hull. Although relatively small in the number of employees, the range of B&L projects is vast, from $500 up to $4 million. The quantity of projects is impressive as well. 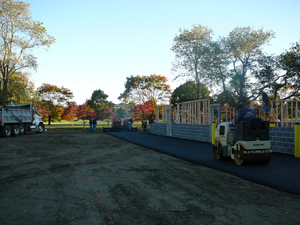 B&L typically completes from 40 to 50 projects a year in the $50,000-plus range and another 40 to 50 jobs of paving smaller driveways. “As our client’s schedules change, we have to be able to change the way we operate and adjust both equipment and personnel needs in order to meet the completion date, especially on the commercial end,” the owner explained. 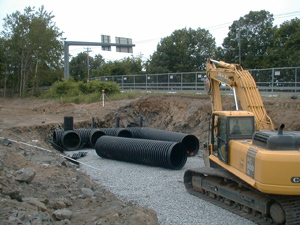 The region is dotted with improvements by B&L, such as Waterford Medical Group outpatient facility, water main work for the Connecticut Water Company, and North Cove Crossing and Hill Farm developments for those over 55 years old. A first-time visitor to B&L headquarters might mistake the company for a Komatsu dealership given the well-kept equipment and the broad selection of models. 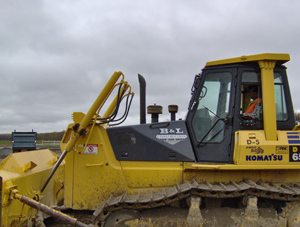 With 24 units, the ratio of B&L field employees to Komatsu machines is nearly one-to-one. With 14 units ranging in size from Komatsu PC30s up to PC300s, the excavator is the most well-represented machine in the B&L fleet. This year, B&L purchased a new Komatsu PC300LC-7 Power Plus excavator. 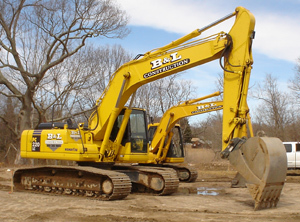 B&L also puts several attachments to work on its Komatsu excavators. Grapples and hydraulic hammers extend the effectiveness of the machines. The JRB quick coupler greatly trims the time needed to switch attachments and, therefore, cuts expenses. Hull supplements his excavators with five Komatsu dozers, the smallest is the D31 and the largest the D65. The dozers are matched in quantity with five Komatsu wheel loaders, starting with a new Komatsu WA250-5 up to the WA380. Hull says the Dash-5loader with hydrostatic controls is a favorite among his operators due to its ample cab design. “The visibility from the cab is one of the big selling points of the machine. It gives the operator a wide range of vision so he can see what he’s actually doing, whether he has the forks on to move pipe on the site, off-load trucks or if he’s using a side dump along a trench,” Hull said. Two generations of sales representatives from East PBE have partnered with B&L: Walter Augur Jr., and before him, his father Walter Augur Sr.
East PBE has access to a replete stock of parts to keep machines rolling. A part that is ordered one afternoon is often installed and the equipment is back in service by the following morning. The nearly 100 projects B&L completes each year are a reflection of the company’s dedication to quality. The same can be said for the type of equipment it operates as well as its commitment to maintenance. “Machines have to be well-maintained, and cosmetically, we do normal painting every five or six years because I believe that your equipment is your image,” the owner related. Another ongoing B&L program underscores the importance of keeping the entire crew focused on safety first. Hull doesn’t expect B&L to grow in numbers of employees. The additions he plans for the future, however, will help secure the natural beauty and preservation of the picturesque Connecticut Shore. “I would like to eventually increase the recycling end beyond what we do today,” Hull predicted. “We already have crushers that we use with material we used to discard from a project. 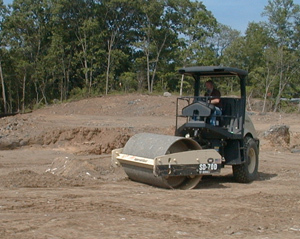 We actually take that material into our yard and make a product, which has helped us become very competitive. Copyright © 2019 B & L Construction, Inc.. All rights reserved.